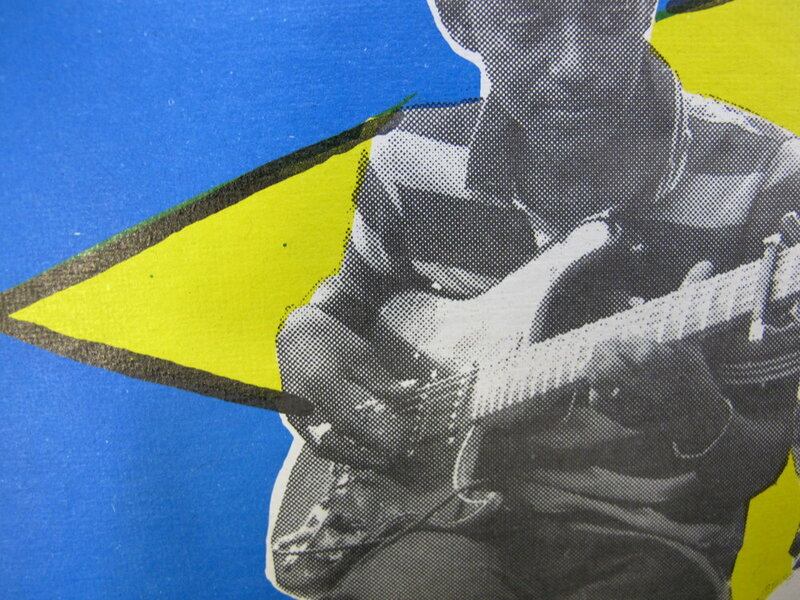 In the works, the latest from Sahel Sounds, an LP jacket for a forthcoming release from Saharan rockers Etran De L’Air. This LP jacket honors 1960s West African record design, which Sahel Sounds founder Chris Kirkley has studied extensively through his efforts exploring and documenting the cultural and musical landscape of the Sahel region of Africa. Collaborating on printing projects with Chris usually involves an investigative look at vintage print samples, identifying the tell-tale characteristics that reveal the story of their print production. Much of the artwork inspiration for the Sahel Sounds record art originated during that sweet spot in print history when analog technology was at its height. The striking and beautiful art compositions included the use of phototypography, letterpress repro proofs, specialty transfer lettering headings, hand illustrations, paste-ups and “mechanicals.” So with Sahel Sounds projects we’ve had the opportunity to explore various direct exposure offset litho techniques, like the use of litho-masks and hand-cut rubylith. For the artwork of this release, Chris created a hand-cut paper frisket for the spot color separations and star images. Another interesting feature in record jacket printing in the analog era is the mechanical variation that can occur. Depending on press settings and sometimes whether the printing press is in proper adjustment, and perhaps more importantly, the temperament and mood of the printer, there are many variables that can affect the outcome and look of the print run. Ink density can vary according to the printer’s set-up, the water and ink balance may be adjusted and shift through a run, registration may migrate due to changes made to the side guide or plate clamp controls. There are certain outcomes from temperature extremes. A printer may prefer running his or her inks “hot” or may push the density or “stack” the ink for higher dot gain. Areas in an image may contain more water from where the moleton rollers are saturated. If the ink body is “short” paper picking might occur, and sometimes the printer remixes ink to adjust the body and tack when necessary, through the print run. Some of these print characteristics may be intentional, others may not, and often a printer will mark a lift when adjustments are made so that they can go back and eliminate the makeready or press sheets that show signs of print adjustments during the run. Whether the printer had a late night, or started an early one, ate well or drank well, was patient or in a hurry, can be seen in print. These trails of clues in the print process, and evidence of personality and the human touch, help to bring more life and dimension to artwork, and enriches the experience of it. Good record jacket design and artwork that matches the music just might help you hear it more fully. And the analog print process can do another thing, especially if you intentionally push it toward the experimental- it redefines the notion of edition work. If you intentionally push the limits of print, wildly push and decrease the ink fountain roller dwell, push the balance of ink emulsification by driving the dampening unit so that it approaches its limit, make multiple head stop and side guide adjustments through the run, by the time you’ve achieved the final run of the printed piece, you have an edition that varies slightly, almost piece by piece. Through this type of experimentation the print process becomes part of the artistic expression rather than just a mechanism that makes the art possible. We ran this Etran De L’Air LP jacket on our 1968 KORD 64 with Chris’s direction, responding to his requests to add variants of registration and ink density, and sometimes even multiple passes of the same form. Through some creative tricks and experimentation we hope that we achieved some of the beauty and lively dimension found in the vintage record art of the collections that we’ve admired. Look for the release of this record in May through Sahel Sounds!